OXFORD, Miss. 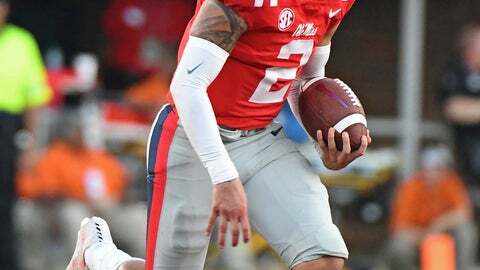 (AP) — Mississippi coach Matt Luke believed his Rebels had not lost confidence despite disappointing performances against Alabama and LSU in Southeastern Conference competition. As it turned out, he was absolutely correct. “We had shown flashes of being really good offensively, even in our losses. Today, we were really consistent,” said Ole Miss coach Matt Luke, as the Rebels scored touchdowns on their opening nine possessions Saturday in a 70-21 win over Louisiana-Monroe. Jordan Ta’amu was 21-of-24 for 374 yards and accounted for five touchdowns. Ta’amu threw touchdown passes to A.J. Brown, D.K. Metcalf and DaMarkus Lodge for 20, 62 and 16 yards, respectively. Ta’amu added touchdown runs of 1 and 39 yards, individually accounting for 437 yards of total offense before sitting out the second half. The Rebels (4-2) scored on drives of 78, 61, 97, 66, 72 and 74 yards to build an insurmountable 49-7 halftime lead. Ole Miss freshman quarterback Matt Corral extended the touchdown streak to nine with drives of 75 and 92 yards in the third quarter. Corral passed 11 yards to Phillips before breaking a 61-yard run to cap the opening touchdown series. Corral finished the scoring with a 24-yard TD pass to Elijah Moore. Corral finished 10-of-10 passing for 143 yards and had six rushes for a game-high 78 yards. ULM (2-4, 0-2 Sun Belt Conference) dropped its fourth consecutive game and never seriously threatened. The Warhawks pulled within 28-7 on an 11-yard scoring run by Derrick Gore. Marcus Green scored on a 71-yard punt return and reserve quarterback Colby Suits threw an 8-yard touchdown pass to Zachari Jackson in the second half. Caleb Evans was 17-of-28 passing for 206 yards and rushed for 37 yards on 13 carries. The Warhawks finished with 427 yards of offense, but they were largely ineffective in the red zone. R.J. Turner had five receptions for 112 yards. The Rebels finished with a school-record 826 yards of total offense, 536 in the first half. Lodge and Brown had nine catches apiece for 179 and 133 yards, respectively. Metcalf added four receptions for 115 yards. Louisiana-Monroe: Green, with four career kickoff-return touchdowns, was impressive as a receiver and returner. The nifty punt return touchdown highlighted a 198-yard performance in all-purpose yards, including a team-high seven receptions for 60 yards. Ole Miss: Lost in the overwhelming offensive performance were encouraging signs of improvement by the Rebels defense. Ole Miss stopped ULM twice in the red zone, had 11 tackles for loss, five sacks and forced three fumbles. Donta Evans and Kevontae Ruggs had fumble recoveries. Injuries forced the conversion of Armani Linton and Tylan Knight from the Ole Miss offense to the defensive secondary. Both responded impressively and disrupted ULM with speed on the pass rush. Knight had three tackles and a quarterback hurry. Linton had six tackles, including a sack, 1.5 tackles for loss and a quarterback hurry. Louisiana-Monroe: Hosts Coastal Carolina on Saturday in Sun Belt Conference play. Ole Miss: Visits Arkansas on Saturday in a division game between winless SEC West teams.